“When I was a boy there was a man by the name of Fish whose job it was to tell us his weather predictions. Mr Fish was good at his job and though he never claimed to be 100 per cent accurate, we trusted his forecasts and adjusted our clothing accordingly. When the storm hit, and thats what it was, just a storm, people didn’t expect it. Lines were down, windows were broken, and Asa Brown found something very odd in his garden pond. It looked like a giant dragonfly, with a spindly body and huge wings, but on close inspection he realised it was no animal, for its skin felt human, it felt like something he had only ever though about when reading books and imagining other worlds. The discovery leads Asa into the past to learn more about an alchemist called Benjamin Tooth, and to a place out of town called the Windvale Moor. It leads Asa on an adventure like no other and has him pondering things he never thought he would ponder. If you are a reader of my blog you will know that I am a lover of 9 to 12 fantasy and the more fantastical the better. 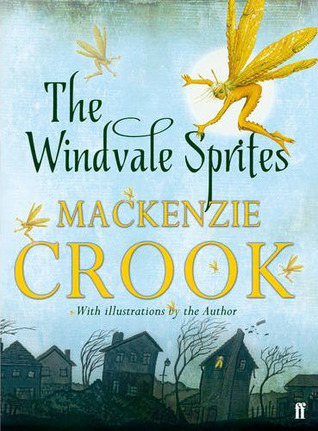 The Windvale Sprites is just the kind of book which will find itself positioned high on my favourites shelf because if is the most fantastical book and whisked me away to this nights reading under the duvet well after bedtime. The story is awesome. Its all about these sprites, or fairies, that Asa believes he found and the link they have to an old man called Benjamin Tooth who lived hundreds of years ago. The way Asa made the connections reminded me of children’s detective stories of old and the sneaking around was genius, though obviously not to be endorsed; kids, don’t lie to your folks and sleep overnight in your local library without permission! I loved how inquisitive Asa was and how that lead to all the discoveries about the sprites and where his adventure took him. This book holds a truly magical story within its pages and you would be mad to miss out on it whether you are 9 or 29! There weren’t many characters and I have to admit other than his inquisitiveness, and the fact he doesn’t like the sound of the school Biology field trip, you don’t get to find out much about Asa or his family. I liked what his actions in the story told me about him though, like how he had a heart for the sprites and how he came across as a bit of a bookish kid what with his frequent library visits and stuff like that. I loved the way the librarians were described and how one of the Sprites in particular portrayed its own personality brilliantly especially towards the end. I was sucked into this fantasy world because it was such a realistic one. I could image the town in which Asa lived was just like my closest town growing up, save for the fairies nearby, and I could have stayed it for much, much longer. I was very sad when the book was over but thankfully I have The Lost Journals of Benjamin Tooth to read and I will be doing so soon. I really think that this book would make for a great christmas present to any child this Christmas and if I knew any 9 year old book lovers they would definitely be getting this from me! The Windvale Sprites was originally published in November of 2011 by Faber and Faber, with a paperback re-release of the book to coincide with the companion book The Lost Journal of Benjamin Tooth on November 7th 2013. My copy was sent to me from the publisher in exchange for an honest review. I LOVE Mackenzie Crook – I wonder if I’d love his writing too!